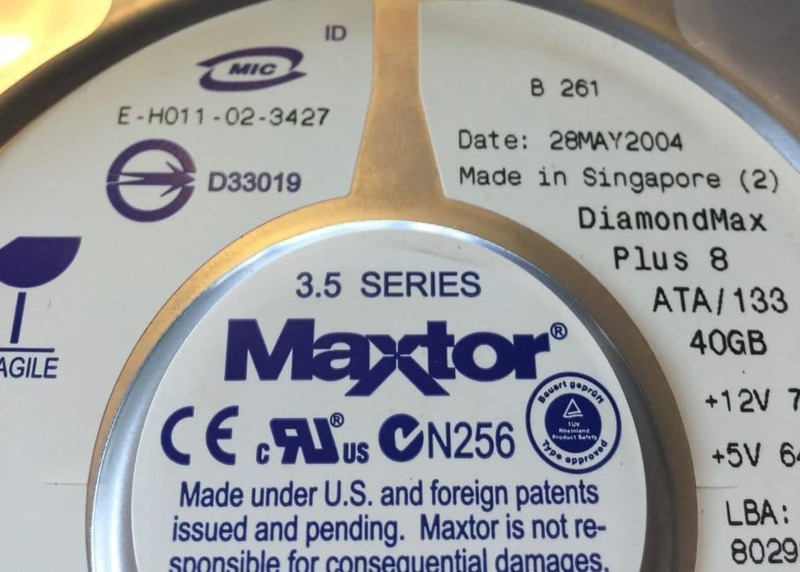 The clients description of the failing drive was spot on, “It spins up, seeks for a while, then spins back down… it just won’t mount.” The drive was an older (2004) Maxtor 3.5″ 40GB drive. SATA (serial ATA) drives were introduced in the early 2000’s (I believe 2003). So if you are using a PATA drive (Parallel ATA) to store data, it is likely to be over 10 years old. The older a drive gets, the more likely it is to fail, so we are never surprised to see PATA drives coming in for data recovery. That is not to say all PATA drives are old… some manufactures still make them for older systems that require replacement drives… but if it is an original PATA drive, it is likely very old now. We have the tools needed to recover newer SATA drives as well as older PATA or IDE drives. Sometimes donor parts can be harder to find for older models… but after years in the data recovery industry, we have access to 1000’s of old drives for parts! In the case of the 40GB PATA drive we just recovered, the issue was a week head and bad sectors throughout the drive. We were able to recover 100% of the drive within 48 hours of drop-off. The recovery was covered under our Tier 1 service, and the client was pleased with the results! On this particular drive when discussing the recovery with the client we initially thought the issue may require a Tier 2 (clean room) recovery based on the age of the drive and the way it was behaving. We were pleased to find that it would not require a clean room recovery and could be recovered under our Tier 1 service. We have found that if the drive has not been dropped (this drive was not dropped), tier 1 recovery is possible about 85% of the time. In this case, the drive had 2 issues (bad sectors and a week head), but in many cases the only issue with a drive is bad sectors. Some people are surprised to hear that bad sectors can cause so many problems. We have seen drives with bad sectors not be readable (even for data recovery software and some data recovery tools), make clicking noises, spin down during use, and more! Hard drives have what are called “heads” that read and write data from the platters of the drive. An overly simplified analogy would be a record player needle. The needle on a record player “reads” the data from the record… if you have a broken needle, you may get some data… but not all the bits of data. With a week head on a hard drive, it is often possible to carefully recover from all the heads that are still working (if there are multiple heads), then target just the files you need that are saved in the area that the week head is in charge of. It can take multiple read attempts to get each sector of data in a bad case, so a delay in the completion of the recovery is very possible.